Continuing in a series called “The Journey of Worship”. Through this series we are exploring – and growing in our understanding of – the elements of Christian worship – as we continue to foster vibrant and engaging worship here at Athelstone. 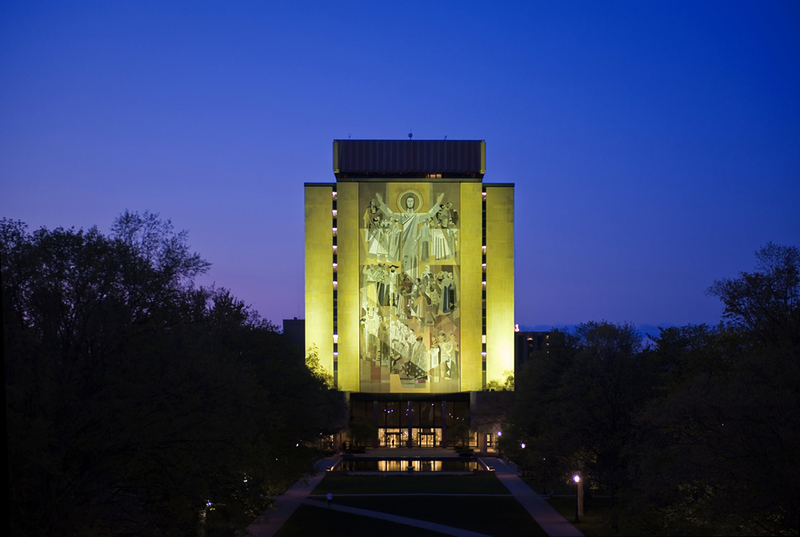 Towering high over the football stadium at the University of Notre Dame in Indiana, is a massive mural, called Word of Life. In the 1960’s, artist Millard Sheets was commissioned to create an artwork to cover the southern wall of the new Library’s tower. Sheets’ painting was converted into a granite mosaic. 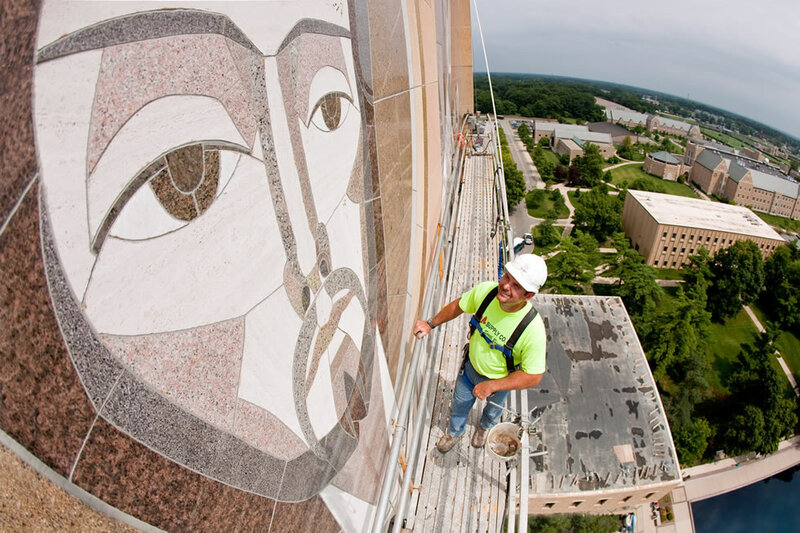 The mosaic is made up of 324 panels and 6,700 separate pieces of granite. The different colours are from 81 different types of stone sourced from 16 countries. Jesus’ arms are raised high to represent crucifixion, resurrection and blessing. 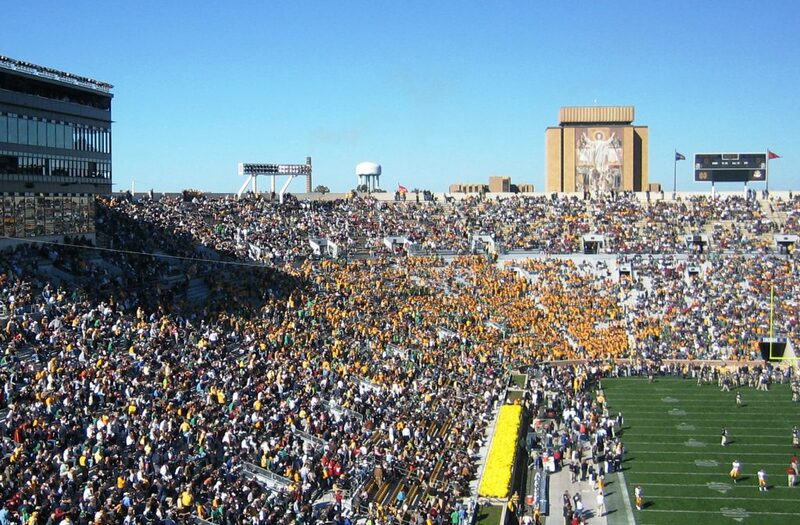 Because of its location overlooking the football stadium, students have given it the nick-name “touch down Jesus”. Jesus with his arms raised up looks similar to how a referee would have their arms raised when signaling a touchdown. Sheets explained that he was asked to suggest in a great processional the idea of a never-ending line of great scholars, thinkers and teachers – saints that represented the best that have been recorded over history, and found represented in the library. Generation after generation, with Jesus at the top with the disciples – Jesus, the great teacher. See if you can recognize in the mural any of the great teachers and prophets of the past who have continued to share the great narrative or story of God. Stories are important, they teach us about our world, our environment, our past. They help us understand where we fit in the world, they help us shape our own identity. As Christians we can see ourselves fitting in to the one big story of life – God’s story – told through the Bible. Note that I said ‘story’ – every culture has its stories – stories that tell the history and shape the identity of its people. The Kuarna people and other first peoples of this land have stories that have been told around the campfire from generation to generation. When the churches that formed the Uniting Church arrived in Australia as part of the process of colonisation they entered a land that had been created and sustained by the Triune God they knew in Jesus Christ. The First Peoples had already encountered the Creator God before the arrival of the colonisers; the Spirit was already in the land revealing God to the people through law, custom and ceremony. The same love and grace that was finally and fully revealed in Jesus Christ sustained the First Peoples and gave them particular insights into God’s ways. One way we could describe the Bible is a collection of stories passed on from generation to generation of God’s grace as God revealed himself to his people in different ways over time. Malcolm Gordon talked about Word and Creed – hearing the Scriptures read, the Word preached and the Creeds recited – as a time of listening. He indicated that the first part of our worship service helps prepare us to listen. If you liken it to the telling of a story, that’s true isn’t it? Before we can settle down to have a story read to us or read one to someone else, there is a time of settling down, clearing some space and making ourselves comfortable, perhaps around a campfire or a logfire – so that we are ready to listen, and free of distractions. That’s what I think Malcolm was talking about. God calls us, we respond with joy, we clear some space by confessing our sins and remembering we are forgiven, then we are ready to settle down and listen to what God has to tell us. It is the telling and retelling of God’s story that helps to form us as God’s people. The Hebrews passage that we heard earlier follows Hebrews 11, where the author lists many heroes of faith: Abel, Enoch, Noah, Abraham, Sarah, Isaac, Jacob, Joseph, Moses, Rahab, David and the prophets, gathering them all into a cloud of witnesses along with Jesus in chapter 12, the pioneer and perfecter of our faith to help us to persevere and not be discouraged. How many times would these stories of these people of faith been told and retold to encourage God’s people? It is through the Word today, that Jesus, the Word, speaks to us, offering encouragement, comfort, strength, hope, wisdom, joy, power, purpose, teaching, correction, and the list goes on! Preachers have the joy and challenge of sharing the Word of God, to proclaim Christ, to teach, to disturb, to reassure, to inspire, to persuade, to challenge, to stimulate and to offer hope through Jesus. The passage from 1 Thessalonians reinforces what happens: the Word is preached, the people believe and are encouraged, comforted and urged to live lives worthy of God. Through the creeds we confess our faith. We tell the story again, a story that took quite some work to agree upon hundreds of years ago, a story that unites us as Christians across denominations across the earth. The Uniting Church enters into this unity with the Church throughout the ages by its use of the confessions known as the Apostles’ Creed and the Nicene Creed. We see these as guiding statements of our faith, to declare and to guard the right understanding of that faith. This future hope of all of creation reconciled – a great multitude from every nation, people and language worshipping our God. All united, for Jesus the Shepherd leads them all – us all – to springs of living water. Our beliefs – our view of the world and how we see ourselves in it – and whether there is a God and why that matters – and where we fit in the one big story – all develop over time. They are shaped by an accumulation of learning and experience. In our time of worship, the intentional time of hearing God’s Word to us and learning more about God comes through hearing the Word through the Scriptures and the Sermon and through reciting the Creeds together. We learn about the character of God, so that we can trust God more. By following Jesus we learn about the ways of God. Through the Holy Spirit we are empowered and equipped to serve God, and be part of God’s plan for reconciliation – our future hope..
Dear @hillsong, could your brilliant songwriters please put the Apostles’ Creed to inspiring music. Do world-Christianity a massive favour. Cass Langton and Ben Fielding from Hillsong quickly replied that their team would ‘have a go’, and a little while later, Ben and Matt Crocker sat down to write a song. There is a power when what we believe in our hearts is brought together with the confession of our lips. Every time we sing this song in our local Hillsong congregations, there is a palpable sense of unity as we sing these powerful and ancient confessions of faith. When Hillsong released the new song, their prayer was, that the song, as a musical and creative representation of the Apostles’ Creed, will help bring people together; in unity with one another and ultimately with God the Father, Jesus Christ the Son, and the Holy Spirit. As we sing we join a never-ending line of saints, scholars, thinkers, teachers, churches around the world, past, present and future, all speaking out – singing out – these unifying words of our Christian faith. You might like to listen to the song here.